Earnings inequality and inequality of household equivalised income in Germany have sharply increased since the mid-1990s (Dustmann et al. 2009, Fuchs-Schündeln et al. 2010, Biewen and Juhasz 2012). An important question that has so far received little attention in the academic literature is whether, and to what extent, shifts in housing costs – a focus of recent public attention (e.g. Handelsblatt 2018) – counteract or further exacerbate inequality in disposable income net of housing expenditures. Changes in housing expenditures have dramatically exacerbated (in terms of real disposable income) the rise in income inequality. More specifically, whereas the 50/10 ratio of net household income before deducting housing expenditures has increased by 22 percentage points (pp) between 1993 and 2013, the same ratio has increased nearly threefold (62 pp) when considering income after deduction of housing expenditures. The 90/50 ratio also shows a stronger increase when housing expenditures are accounted for, but less so than the 50/10 ratio. Factors contributing to these trends include a decline in the relative costs of homeownership versus renting, changes in household structure, and residential mobility toward larger cities. At the bottom of the income distribution, increasing housing expenditures and falling real incomes cause a disproportionate decline in consumption and savings. Younger cohorts spend more on housing and save less than older cohorts did at the same age. This has serious consequences for wealth accumulation, particularly at the bottom of the income distribution. Homeownership rates in Germany are far lower than those in the UK or the US, with about 45% of German households living in a property they own in 2014, as compared with around 64% in the UK and 65% in the US (see Table 1). Moreover, while almost 50% of UK households and 36% of US households in the bottom income quintile own their homes, this is the case for only 22% of German households. One important reason for the lower share of homeowners is the stricter mortgage lending requirements in Germany that result in access to mortgages being more constrained, in particular for low-income individuals. There are also stark differences in the development of the housing market between Germany and the UK/US. While real house prices in the Anglo-Saxon countries show a strong long-term upward trend, interrupted by the Great Recession, in Germany they stayed flat in the early 1990s, fell from the late 1990s onward for the next decade, and rebounded modestly after 2010 (see Figure 1a). Real mortgage interest rates followed a similar falling trend in all three countries since the 1990s, which benefits homeowners with an outstanding mortgage. However, the mortgage debt-to-GDP ratio decreased in Germany, while it increased considerably in the Anglo-Saxon countries. For instance, the 2015 mortgage debt to GDP ratio in Germany was about 42%, compared to 63% in the US and 68% in the UK. Reasons for these differences are the lower share of homeowners in Germany, resulting in lower demand for mortgage credit in times of fairly stable house prices, as well as the stricter lending requirements for mortgages. 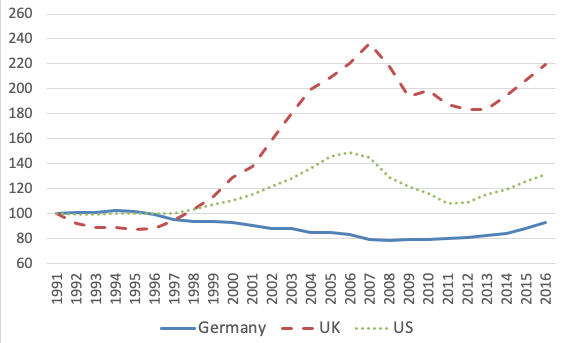 There are also marked differences in the development of real rents between Germany and the UK and US (Figure 1b). 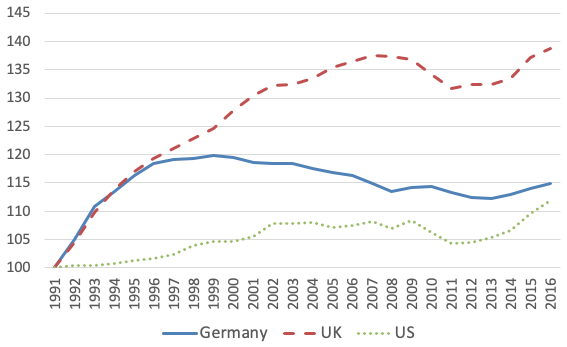 While real rents increased in Germany by about 20% between 1991 and 2000 and remained constant afterwards, they continued to increase in the UK and US until the Great Recession. Regulations in Germany restrict rent increases for sitting tenants, while allowing more flexibility for rents for new contracts, which in the tight housing market after 2010 increased by about 15% in real terms (or as much as 19% for city dwellers) up to 2016. Between 1993 and 2008, real equivalised net household income in Germany sharply dropped at the bottom of the distribution (by 11% at the 10th percentile), slightly increased at the top (by about 3%), and slightly declined at the median (by about 2%), while it increased along all percentiles between 2008 and 2013 (Figure 2). The cumulative real income change between 1993 and 2013 was -10% at the 10th percentile, +2% at the median, and +7% at the 90th percentile. Source: Income and Expenditure Survey Germany, author calculations. 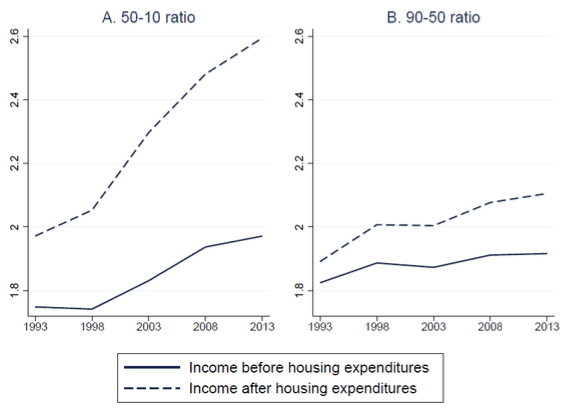 When comparing the ratio of the 50th to the 10th percentile and the ratio of the 90th to the 50th percentile before and after deduction of housing expenditures, a remarkable divergence emerges (see Figure 3). Between 1993 and 2013, the 50/10 ratio of income before housing expenditures increases from 1.75 to 1.97 (i.e. by 22 pp), while the 50/10 ratio of income after housing expenditures increases from 1.97 to 2.59 (i.e. by 62 pp). Thus, the increase in lower-tail inequality almost triples once housing expenditures are taken into account. The 90/50 ratio also shows a stronger increase over time after housing expenditures are accounted for, but the difference is smaller than its 50/10 counterpart. Thus, accounting for housing expenditures greatly exacerbates the trend in inequality illustrated in Figure 3, in terms of after-housing disposable income. This aggravating effect of housing expenditure on after-housing disposable income inequality implies that housing costs evolved differentially along the income distribution. 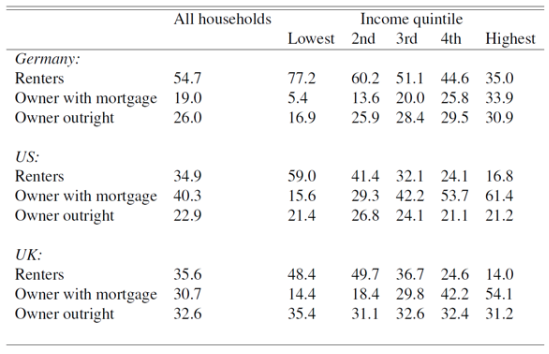 Tracing the 1993-2013 development of housing expenditures across income groups, the left panel of Figure 4 shows a 32% increase in mean housing expenditures for individuals in the lowest income quintile, but a 9% decline for those in the highest. The middle panel illustrates that these trends went parallel with diverging equalised net household income. 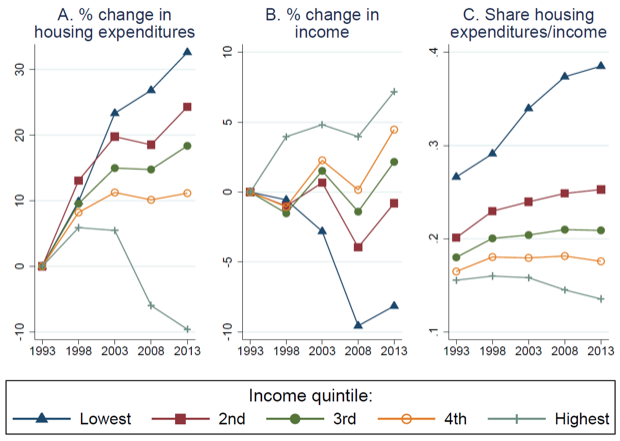 Combining the two figures, the right panel shows a sharp increase in the share of household income spent on housing in the lowest income quintile (from 27% in 1993 to 39% in 2013), while it declines in the top quintile (from 16% in 1993 to 14% in 2013). What explains the evolution of the share of housing expenditures over the income distribution? We further investigate the reasons for the differential impact of changes in housing costs along the distribution of income. As a key driver, we identify the change in housing costs for those who rent versus owner-occupiers. While rental prices sharply increased during the 1990s (see Figure 1b), housing expenditures rose far less for owner-occupiers and even fell after the mid-2000s because of falling mortgage interest rates and lower outstanding mortgages. As owners are more likely to be from the upper part of the income distribution, this contributes to the distributional changes illustrated above. In addition, shrinking household size throughout the 1990s and 2000s increased housing expenditures per capita, a demographic trend that is strongest at the bottom of the household income distribution. Movements from East to West Germany during the 1990s and an increasing migration of low-income individuals to more expensive urban areas also contributed to the development, while the decline in the provision of social housing was of minor importance. Lastly, because housing is a necessity good, declining real incomes at the lower end of the distribution increased the share of income spent on housing. An important consequence is that successive birth cohorts not only start with higher inequality, but also that younger cohorts spend more of their income on housing and save less than older cohorts did at the same age. This is particularly the case for young individuals at the bottom of the distribution, with potentially severe implications for future wealth inequality. What are the lessons for the international debate on the link between housing expenditures and income inequality? While housing costs have greatly exacerbated income inequality net of housing expenditures in Germany, these developments are modest in comparison to Anglo-Saxon countries (Albouy et al. 2016, Larrimore and Schuetz 2017, and Belfield et al. 2015, who document rising housing expenditure shares, especially for renters and low-income individuals, for both the US and the UK). This can be explained by the more moderate development of house and rental prices in Germany (see Figure 1). Homeownership rates in Germany slightly decrease for the most recent cohorts, although the changes across generations are again far smaller than in the US or the UK (Belfield et al. 2015, Goodman and Mayer 2018). Finally, in contrast to the UK, where per capita household living space fell, housing quality for low-income individuals in Germany improves over time. In conclusion, although the developments in housing expenditures in Germany are relatively modest when compared to the US or UK, the strong rise in inequality of after-housing disposable income has nonetheless important and worrying consequences. For the bottom income quintile, the savings rate fell from 2% in 1993 to -1% in 2013, with a decrease in the share with positive savings from 64% to 53%, and slightly lower decreases for all other income quintiles. That a large and growing share of low-income individuals does not save is certainly worrying, in particular as lower access to mortgages in Germany (relative to the US and UK) reduces the possibility of wealth accumulation through housing property, especially for the less well-off. Rising inequality in savings is thus even more likely to contribute to higher wealth inequality in the future. Albouy, D, G Ehrlich and Y Liu (2016), “Housing Demand, Cost-of-Living Inequality, and the Affordability Crisis”, Discussion Paper, University of Illinois. 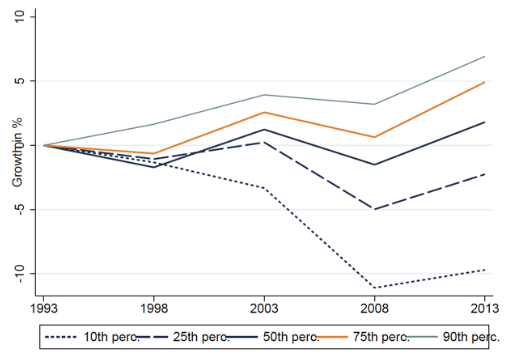 Biewen, M and A Juhasz (2012), “Understanding Rising Income Inequality in Germany, 1999/2000-2005/2006”, Review of Income and Wealth 58(4): 622-647. Belfield, C, D Chandler and R Joyce (2015), “Housing: Trends in Prices, Costs and Tenure”, IFS Election Briefing Note BN161. Dustmann, C, J Ludsteck and U Schönberg (2009), “Revisiting the German Wage Structure”, Quarterly Journal of Economics 124(2): 843-881. Dustmann, C, B Fitzenberger and M Zimmermann (2018), “Housing Expenditures and Income Inequality ”, CReAM Discussion Paper. Fuchs-Schündeln, N, D Krueger and M Sommer (2010), “Inequality Trends for Germany in the last two decades: A tale of two countries”, Review of Economic Dynamics 13: 103-132. Goodman, L S and C Mayer (2018), “Homeownership and the American Dream”, Journal of Economic Perspectives 32(1): 31-58. Handelsblatt (2018), “Germany aims to ease housing crisis, but measures may fall short ”, Handelsblatt Global, 30 August2018. Larrimore, J and J Schuetz (2017), “Assessing the Severity of Rent Burden on Low-Income Families”, FEDS Notes, Board of Governors of the Federal Reserve System, 22 December. https://doi.org/10.17016/2380-7172.2111 . OECD (2014), Affordable Housing Database  (downloaded on 15 May 2018).